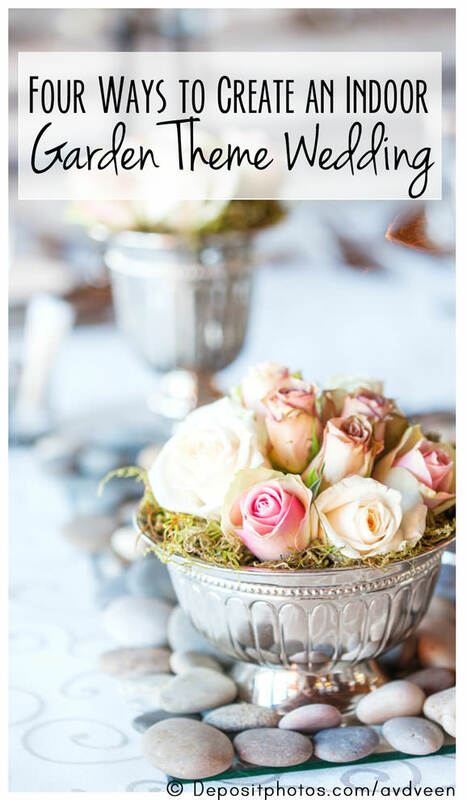 Have an indoor Romantic Garden Wedding Theme any time of year! Forget the stress of unknown weather conditions. These four ideas will help you create a gorgeous wedding. Garden weddings are instantly romantic and pleasing to the eye. Everyone loves flowers, greenery, and soft lighting. Your guests will be delighted to walk into such a serene and lovely setting. Choose some or all of these ideas to help create a garden-like atmosphere indoors. Even if the wedding budget is small, having some of the following decorations will give your wedding a beautiful garden feel. Having small lights strewn throughout the venue will quickly give your wedding a garden feel. Dim lighting adds to the romantic garden wedding theme feeling. To save on cost, arrange white Christmas lights throughout and then scatter paper lanterns and hanging tea light holders. If you can get your hands on some lamp posts, that would be a perfect finishing touch. If you can get your hands on an archway, some kind of wooden fence post or even a pergola, this will give you the perfect way to hang greenery and lighting. It will instantly transform the look of the indoor venue. This goes without saying…flowers are the essential feature for garden themes. Use fresh flowers where you can to create a soft, yummy aroma and then use fake petals and flowers to save on costs. You can purchase bags of fake rose petals to scatter everywhere, including the aisle you’ll walk down for the actual ceremony. Ribbons are another way to quickly add to the garden feel. Use wide ribbons around the backs of chairs or on tables, lamp posts or trees. Indoor garden weddings are beautiful without the stress of weather conditions! It’s a perfect combination that you and your guests will thoroughly enjoy.